CONGRATULATIONS you have earned a PDI Badge! After all the hard work you have put into your development, be proud and display your accomplishment on your Game Jersey(s) and Practice Jersey(s). ONLY IF you have a PDI Badge on your left shoulder already, then place your new PDI Badge on your RIGHT SHOULDER. When you place the PDI Badge you should see if from the side profile, not from the front. See the image to the right for an example. The bottom of the badge should be 3 inches from the bottom of the sleeve. *smaller youth size jersey(s) may have be centered or 2 inches from the bottom of the sleeve. Print/Read and follow the iron on instructions. Make sure you DON'T BURN your jersey in the process with the iron. Players will not be able to place their PDI Badge on the BLUE Squadra Jersey. 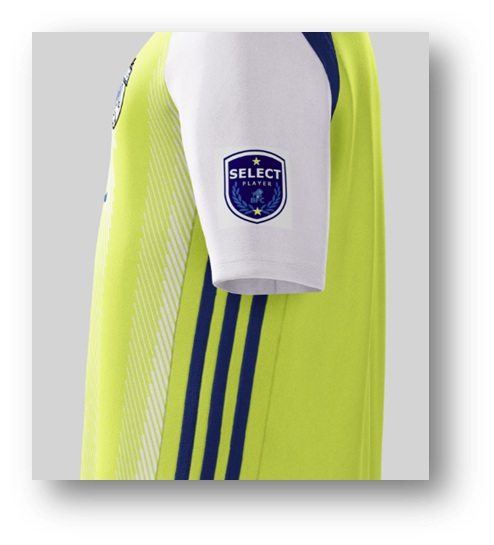 This jersey has a piping around the sleeve which will not allow for proper transfer onto the jersey sleeve.